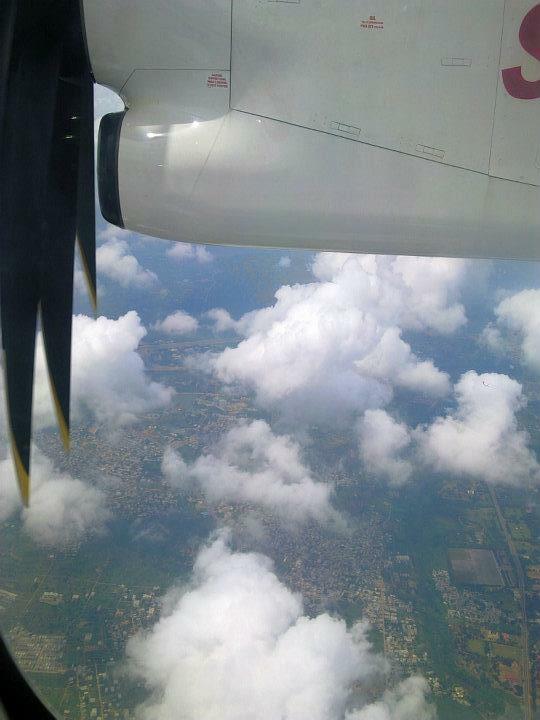 The writer (The Flying Engineer) was at Hyderabad and experienced the “familiarization” flight on the Q400, on the invitation of Spicejet. The Flying Engineer was the only one to have seen the cockpit as well (including a nice four minutes in the first officer’s seat), leading to an opportunity to experience the layout, and ergonomics of the flight-deck. September 15th 2011: On a bright day with wispy clouds and partly overcast skies, two aircraft sat basking in the sun at stands 40 and 41, at Hyderabad’s International Airport. Visible to all arriving and departing traffic, sharp eyed flyers stared at the aircraft that is new to the Indian skies. The much heard about Bombardier Q400s are here, with VT-SUA and VT-SUB flying daily out of Hyderabad on training flights, with the other two, VT-SUC and SUD, at Delhi clearing DGCA formalities. —A Q400 at Hyderabad greeted on arrival with the traditional water salute! Seventy Eight people, of which most were journalists and the rest Spicejet officials, boarded the Q400 christened “Saunf“, becoming the first set of passengers in the country to fly on board the Q400s from Canada. Unlike its competitor, the French ATR72s, the Q400 was boarded from the front of the airplane. 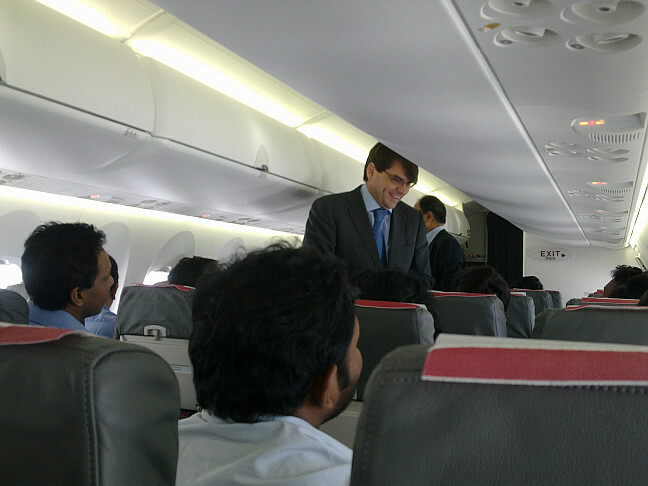 A brand new aircraft cabin greeted the men and women who were to experience a one hour flight around Hyderabad as part of Spicejet’s media event. is new. The air conditioning was turned on at full blast, despite both engines being turned off: the APU at the back of the airplane was working its magic. The cabin overhead bins are very large for a plane of such size, comfortably taking on the cabin baggage of all 78 passengers. 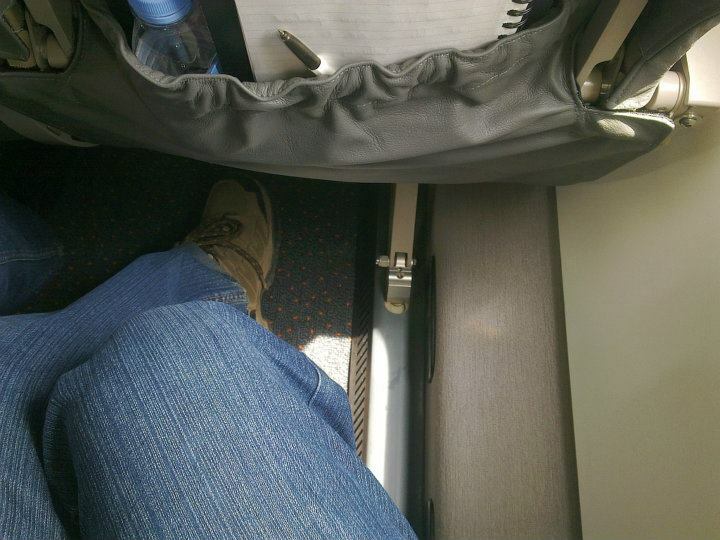 The legroom on board the aircraft is very good, matching that on board their Boeing 737s. The recline however is uncomfortable, and barely sufficient. The window seats are a tad bit uncomfortable in comparison to the aisle seats: a duct running along the length of the cabin on the floorboard prevents you from stretching your legs absolutely straight. The engine start was absolutely silent, and the taxi out of the Q400 is definitely a lot quieter than the ATR72s. The aircraft, under the command of Captain Theo and the Deputy Chief Pilot, Captain Surinder Singh, began its take off roll at 11:40am, with a power that is unfathomable for an aircraft of its category. The take off was absolutely noisy, with the rattling of the panels adding to the noise. But after about a thousand feet above Hyderabad, the RPM of the propellers was pulled back to 850, and then onwards, the cabin was quiet. noisiest, and yet, the noise wasn’t much. 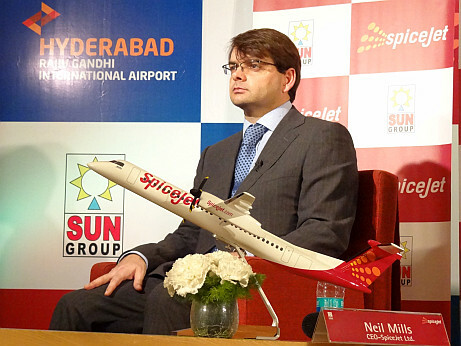 Flying at about 13,000 ft over the beautiful city of Hyderabad, Neil Mills, CEO of Spicejet, took over the cabin intercom from the cabin crew, addressing the media that were gathered to experience the Q400 first hand. individual questions and taking passenger feedback. On flying to critical airfields, “We’re being safe for now, flying to safe airfields. Later, as our competency builds up, we may expand to (such) fields”. When asked on getting pilots for the Q400 turboprop, “We are taking in ab-initio pilots, and expats who are experienced on this aircraft type. And ofcourse, there are the guys from Kingfisher”. 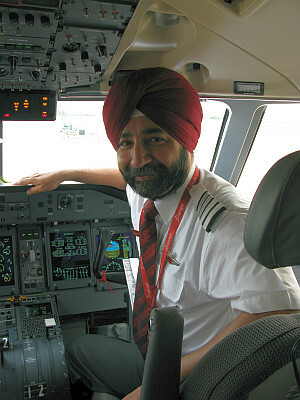 The Deputy chief pilot himself was formerly with Kingfisher airlines, flying the ATR72s. A stroll up and down the cabin allowed the Q400’s features to stand out. Unlike in the ATR72, the aft cargo hold is not accessible from the cabin, which automatically adds one point in the favour of flight safety and security. The fwd cargo is accessible, but hardly anything is stored there. Being the forward cargo hold, any access will be detected by the passengers and crew. The forward lavatory is a plus point. Access is better, unlike the crammed entrance on the ATRs. Besides, who who enter and exit are always under the scanner of the eyes of passengers and the crew, resulting in higher safety. Crew members need not walk all the way down the aisle for a restroom visit. In the words of Capt R.S. 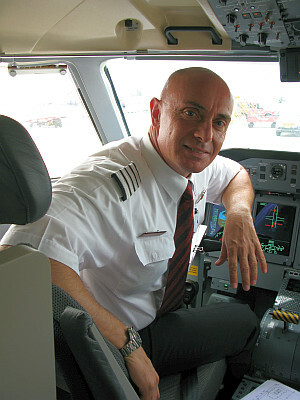 Makker, a commander on the Q400, “In an ATR, a passenger can knock you in the stomach and incapacitate you. But in the Q400, you’re out of their reach!”. In the formal press conference, Neil Mills termed the Q400 a “Game Changing” aircraft, substituting the “inferior product” that presently is in use by competing airlines, while connecting Tier II and Tier III cities with the metros. With promotional fares of Rs 999, all inclusive, Neil Mills is certain that passengers will now “change habits” by abandoning trains or thinking twice before using their cars and instead fly out of the 12 destinations in the “high volume, high value product” that the Q400 connect Hyderabad with, including the presently unconnected pairs of Hyderabad- Aurangabad, Hyderabad-Madurai, Hyderabad-Mangalore, Hyderabad-Trivandrum, Bangalore-Vizag and Vizag-Tirupati. The plans are big: by March end all 15 Q400s purchased by Spicejet are expected to be in India, operating 100 flights a day with an anticipated 75% load factor. He gives the airline 12-18 months to build money on these routes that employ the Q400, blaming “illogical competition (pricing), where people have no financial accountability” as possible hurdles. When asked on the on-time-performance (OTP) of the airline slipping to 76%, while Indigo maintained 90%, and how they plan to tackle that, Neil strongly declared that the airline declares the actual OTP, as opposed to other airlines. —Neil Mills at the press conference. On the question of “bleeding” pilots and other resources to other airlines, he shrugged them off as rumours, citing, “services not being affected by lack of resources, proof of which lies in their expansion plans and acquisition of new aircraft”. Neil did also mention that they wouldn’t have gone in for a new aircraft had the Tier II and III cities been accessible to the Boeing 737 aircraft that they presently use. “It keeps the complexity out of the business with a single aircraft. The Q400 is a reaction to infrastructure needs. Not all aircraft can do it (Tier II and Tier III operations)”. He cited the infrastructure to be “very good” at GMR’s Hyderabad Airport, as the reason for choosing Hyderabad as the base for the Q400s. How the Q400 performs is a matter of time. Most passengers won’t be able to appreciate the differences between the ATR72 and the Q400. Finally the battle between the airlines will boil down to the economics of operations. Spicejet claims that the Q400 gives them the lowest cost per seat in the industry; but that is only indicative of capacity and not a reflection of the reality. With time throwing in the load factors and dividing the passenger traffic, which airline’s aircraft type stands the test of the tide is to be seen. Also some of the data seems odd, for example the Hyd-Rajmundry sector does not have any other Dash-8 connections from the either side (atleast not listed). What is this aircraft doing when it is not servicing that sector?